Christmas Day may be the sole holiday when the Smithsonian Museums close their doors, but that doesn't mean your stuck inside. Gather your friends, family or self and enjoy the city on what's forecast to be a seasonable holiday with some sun, some clouds and temperatures in the low-40s. After the government shutdown left the site dark and the lights turned off, the National Parks Foundation stepped in to fund its reopening. It will be open 10 a.m. to 10 p.m. on Christmas Day. 100 Maryland Avenue, SW, Washington, D.C. The U.S. Botanical Gardens are open on all holidays, according to their website. The Conservatory is open 10 a.m. to 5 p.m. daily. 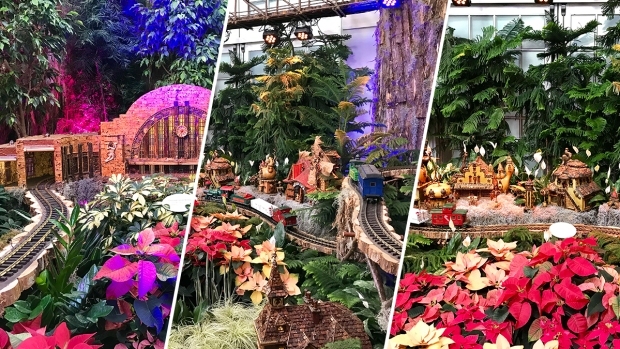 Every holiday season, a line stretches outside the door of the U.S. Botanic Garden when a stunning, lush holiday train exhibit sets up shop inside. This year, you'll find recreations of train stations from across the country, including Union Station and New York's Grand Central. Each station is made from plant materials showcases each building's intricate architecture. There are also two stations just for kids, including the North Pole. You can see it all from Thanksgiving through New Year's Day. 1238 Maryland Ave. SW, Washington, D.C.
D.C.'s digital art house known for its immersive digital spaces is selling timed tickets for Christmas Day. 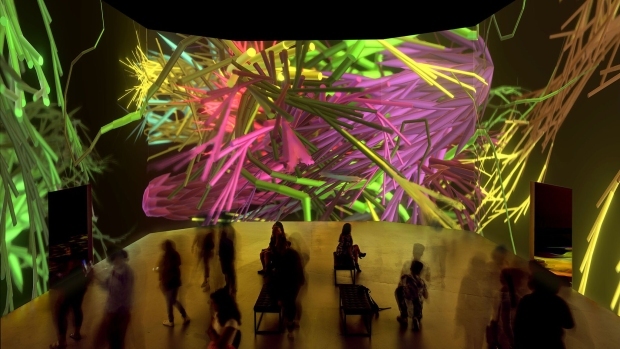 Check out the current exhibit, "New Nature:"
Artechouse — DC's digital art house known for its immersive digital spaces — is opening its latest interactive exhibit, New Nature. Take a look. Georgetown Glow is open from 5 p.m. to 10 p.m. You can catch 11 whimsical and bright displays across Georgetown. Here's a map of the sites. 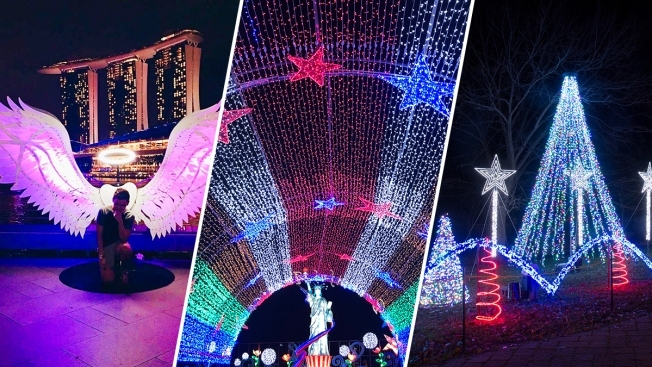 LightUP Fest at One Loudoun us open from 5:30 p.m. to 10:30 p.m. on Christmas Day. Photos: LightUP Fest Brings 1 Million Lights to Loudoun Co.
More than 100 circular light pads illuminate The Yards nightly from 6 p.m. to 10 p.m. for Light Yards. The National Cathedral hosts an organ recital with selections from Tchaikovsky's "Nutcracker Suite" and more holiday music. It begins at 1:30 p.m. and a $10 donation is recommended. 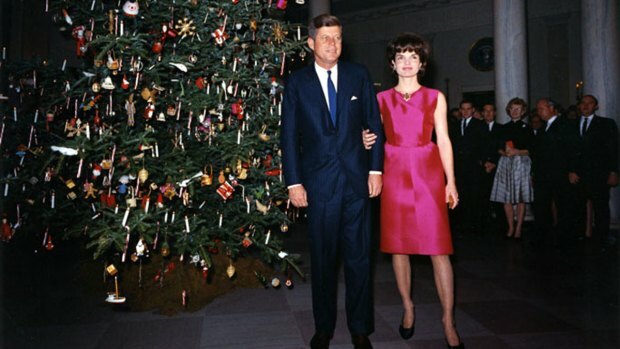 The Kennedy Center keeps the musical spirit going with an All-Star Christmas Day Jazz Jam at 6 p.m. It's free to attend. In Takoma Park, you can catch a free live jazz show at Takoma Station Tavern. Doors open at 6 a.m.; it's free until 9 p.m.
For something less traditional, check out Project: #merrytxtmas at Rhizome DC. Santa will be sneaking around and putting on a show based on the audience's cell phones. Rinks that are open on Christmas Day include the Washington Harbour Ice Rink (3050 K St. NW), the Canal Park Ice Rink (200 M St. SE), The Wharf Ice Rink (960 Wharf St. SW), Pentagon Row Ice Outdoor Skating Plaza (1201 S. Joyce St., Arlington) and the Rockville Town Square rink (131 Gibbs St., Rockville). A lot of major titles are out in time for the Christmas holiday, including "Aquaman," the latest Marvel movie, "Bumblebee," a female-led film in the Transformers franchise, and "Mary Poppins Returns." Theater chains that will be open include Landmark, AMC and Regal Cinemas. Rock Creek Park trails are mostly open despite the government shutdown, an opportunity to bundle up and get a little active after that third (or fourth, or ninth) Christmas cookie. In Northern Virginia, the W&OD is a 45-mile route from Shirlington to Purcellville and includes a 32-mile horse trail for equestrians. Other popular trails include the Mount Vernon Trail, the Martha Custis Trail, and the Four Mile Run trail, with some of them meeting up at different points so you can plot your own route. Maryland has many scenic trails to bike and walk through, including the Billy Goat Trail, which stretches along the Potomac River and is divided into three sections. You can choose from a challenging rock scramble or a more even path, or try all three. Check out trail hours and safety warnings before going. The Maryland Department of Natural Resources has an interactive map so you can find a trail near you. Although the National Park Service isn't operating, you can visit the National Mall and Tidal Basin. There are even some restroom facilities that are open, which you can read about here. D.C.'s Capital Bikeshare offers bike rentals through the holidays starting at $2, and many companies will be renting out dockless bikes and scooters through apps including JUMP, Lime, Spin, Skip and even Lyft. Step back in time and tour George Washington's historic home on Christmas. If you purchase online, tickets cost $11 for youth age 6 and up, $17 for seniors and $18 for adults. 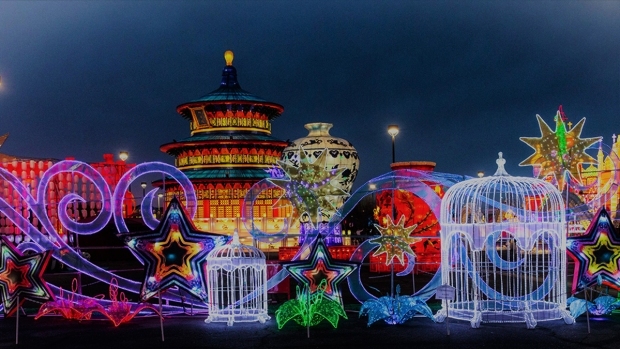 Keep your eye out for Aladdin, the Christmas Camel, and other holiday entertainment.